Syda Bbumba Minister of Finance! 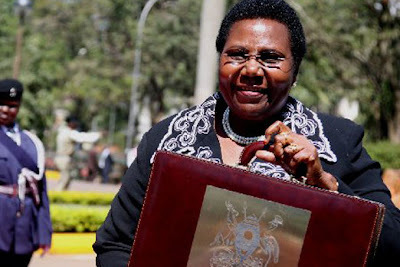 Many people saw the 2010/2011 Uganda Government Budget as meant to will over votes for the Museveni Government which according to some of us would have not lived beyond the 2006 but the militarism. When we get to budget performance, it is not likely that the budget may have 30% performance, that is achieving its objectives. I wish someone gave us the actual position 'not the cooked one'. What people expected may be better termed as 'air supply'. It is now two months to the close of the financial year. Theme: Strategic Priorities to Accelerate Growth, Employment and Socioeconomic Transformation for Prosperity. HAS THE GOVT. OF UGANDA HANDLED LEGALITY MATTERS WELL REGARDING LIBYA ASSETS ? There are questions as to whether Uganda Government has done the necessary legality issues before the handling of Libyan investments in Uganda. We know the liability the country is likely to finally be in when the NSSF and the Kenya company which had been contracted before the 'illegal termination' finally gets to conclusion. The Parliament of Uganda seems to have been bypassed in all this. Let's hope for the best. The government of Uganda has taken over shares in Libyan owned businesses and the recent take over was in UTL, a telecom company in the country in which Libya owns 69%. UTL has about 1.75 million subscribers and recently, MTN, its rival, has vowed to disconnect UTL over unpaid dues so that an MTN subscriber can not call a UTL subscriber and vice versa. UTL has become the second entity in which Libya has a direct stake to fall under government control. UTL is under one of Libya’s investment arm, Libya Africa Investment Portfolio. Bank of Uganda last week relieved the Libyan Foreign Bank of its shareholding in Tropical Bank. The Libyan Foreign Bank owned 99.7% of Tropical Bank’s portfolio. In freezing the Libyan Foreign Bank assets, Prof. Tumusiime Mutebile, the central bank governor, said all management appointees by the Libyan Foreign Bank were immediately relieved of their duties and a new management was appointed. Aggrey Awori, the Information, Communication and Technology (ICT) minister, said the Government was exercising its oversight role and also complying with UN sanctions against Libyan assets. “We have to monitor all the transactions in conformity with the rules and now they cannot make certain decisions without our knowledge,” said Awori. Awori said employees and Ugandans should not worry because the Government would normalise operations. “The situation will be stabilised and all uncertainties will be eliminated within a week,” said Awori. However, Donald Nyakairu, utl’s chief legal and corporate affairs officer, said they had not yet received the information and operations were going on normally. “Probably they are thinking about it (the take-over), but nothing has changed. They have not approached us,” said Nyakairu. Uganda Communications Commission boss Godfrey Mutabazi also said he had not been told about the new development. Awori also said the Government was planning a major monitoring of the telecom sector to bring the recent telecom bickering under control. “The way events have been unfolding is “eyes on, hands off “but now we want to have hands on,” said Awori. MTN recently threatened to switch off all calls to utl over claims of an unpaid sh20b debt. Awori said he needed 48 hours to confirm whether there would be changes in utl management. The death of Okello due to mistaken identity is one incident that was overdue to happen given that many people have the same name as this case. This is a precedent which calls for a legislation to have all the newly born to be given names which are made up of three names to give one's identity. So sad that the 'insane' woman did the unthinkable. Those are the people we have. He is gone, sent to an early grave by a stranger, apparently hired by a jilted lover who in the fit of jealousy, plotted to end the life of her rival’s child. In this callous case of mistaken identity, and as fate would have it, the assailant picked the wrong child, and allegedly murdered him. The three-year-old boy shared a name with the other child, who apparently was the real target of the assailant. This is the sad story of Steven Okello, whose tender life was cruelly ended in a feud his family knew nothing about. Police and relatives recovered his lifeless body tucked in a swamp in the outskirts of Lira town last week. Four days later on Sunday, inconsolable relatives and mourners buried Steven, in an emotional send off. A cloud of grief shrouded the air at the burial place as despair descended upon hundreds of mourners, overwhelmed by the stark reality of the misfortune. In a tragic plot, the deceased was picked from Montessori Nursery School in the heart of Lira town by a boda boda cyclist. The motorcyclist had produced a letter to the unsuspecting school administration, purportedly written by the child’s mother Jacky Ejang. The letter stated that the child was sick and was being taken to hospital for treatment. 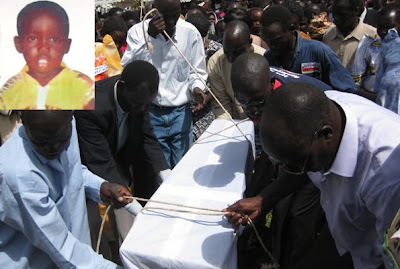 “He is not the one who usually picks me from school, I don’t know this boda and I am not sick,” sources, who witnessed how the child was picked but were not willing to be identified, narrated how Okello instinctively protested before he was ingeniously taken away to meet his death. When his parents found out that he was missing, the school authorities confirmed that there were two pupils in the same class sharing the name, Steven Okello. That is how the mishap occurred. The deceased was mistakenly killed in the place of his namesake. They called the parents of the other Okello, Tony Otuku and Jacky Ejang, who promptly accused their son’s step mother, Pamela Atyang, of the heinous crime. Mr Otuku, a driver in Lira town, sent his condolence to the family of his son’s namesake, but thanked God for sparing his son’s life. The driver disclosed that his wife had threatened to harm his children whom he had with Ejang. “So I am sure, my wife picked and killed another child but her target was mine,” he said. Yesterday, Ms Atyang, 23, who resides at Akite Nino Village in Lira Municipality, was produced in court. The young woman appeared before Grade Two Magistrate Edward Etot and was charged with murder. Court heard that Atyang and others still at large on March 22 killed Okello. The Magistrate’s court had no jurisdiction over her case, and Atyang could not take plea and was remanded to Lira Central Prison until April 12 when she will reappear for mention of her case. Steven’s grandfather Alele Okello said he alerted the police the evening his grandchild went missing, but police reportedly said it was already late and they would only be able to launch a search for the missing child the following morning. Alele now wishes if only police had listened to them and acted, the child would have survived. Lira Resident District Commissioner Susan Akany accused the school of laxity and warned proprietors that they risk their institutions being closed if they do not take the security of children seriously. The Regional Police Commander Central North, Mr Raymond Otim, also assured mourners to be hopeful as he will do all possible to bring the suspects to book. Is This the same guy M7 who went to USA okulonkoomayo Gadafi that he wants to kill him ? President Museveni and four other African leaders are unlikely to make significant headway as they take on an African Union mandate to seek peace in Libya because of overwhelming Western interests. Other leaders on the team are: South Africa’s Jacob Zuma, Gen Sassou Nguesso of Republic of Congo, Amadou Toumani Toure of Mali and Mouhammed Abdul Aziz of Mauritania. The AU commission president, Jean Peng, and the incumbent AU chairman, Teodore Obiang Nguema Mbasogo, are also members. The crisis that has raged on for five weeks now has provided the biggest test to Libyan leader Col Muammar Gaddafi’s 42-year- old leadership of the oil-rich country, leaving in its wake thousands dead and a trail of destruction. Yet, if the leaders – currently stationed in Mauritania as they seek permission from the United Nations to fly to Tripoli – are to succeed, they will have to overcome the larger-than-life personality of Gaddafi, the influence of Western powers, and add more bite to the African Union, which has a poor record in resolving conflicts among member countries. These hurdles, according to political observers, could be hard to overcome and the situation is not helped by the contradictions and the lack of influence of the AU over its member states – factors that were brought to the fore during the passing by the United Nations Security Council, of the resolution on Libya. 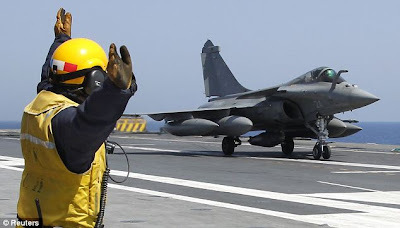 While the continental body made it clear, from the onset, that it would not support the imposition of a no-fly zone over Libya, all the three African non-permanent members on the UN Security Council – South Africa, Nigeria and Gabon – voted in favour of tough action against Libya. In an article after the vote, The New York Times, an influential US newspaper, detailed how Obama cajoled African countries to support America’s position at the UN. 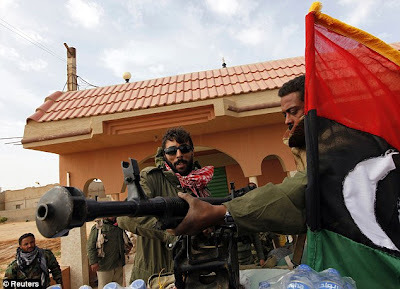 The report said South Africa and Nigeria, along with Brazil and India, had all initially opposed the idea of authorising force against Libya, but US officials somehow convinced them to change their mind. “Mr Obama had already been on the phone pressing President Jacob Zuma of South Africa to support the resolution… Eventually, the South African representative showed up to vote yes, as did the Nigerian representative, giving the United States one vote more than required,” the article noted. From what transpired at the UN, it is clear that the United Sates and its allies – and not the AU – will have the last say on how the Libyan crisis is resolved. The hard stance adopted by Obama in the wake of the resolution, in one instance telling reporters that the UN position was “not negotiable”, shows that the US is already in charge. Secondly, some European countries such as Spain and France have more to lose if the Libyan conflict persists, given that they are already experiencing an influx of refugees from Libya, which is putting a strain on basic services at home. This explains why they have been outspoken in the way forward on Libya. In fact, France has already pledged troops in case a military option is chosen. Besides this geo-political aspect, what makes Libya even more important to the West is her oil reserves. Such overwhelming European interests are unlikely to be subjected to an African Union opinion. The other important entity in Libya’s case is the Arab League, a body that brings together Arab nations. In fact, the UN resolution requests “the cooperation of the Arab League” if its implementation is to be successful. The African Union is not mentioned because it doesn’t really matter. Most Arab speaking African countries tend to regard highly their membership of this organisation and that is why they are most likely to listen to it than to the AU. The Western powers also take this group’s opinion more seriously. It, therefore, comes as no surprise that Obama and other world leaders consulted widely with the Arab League and not the AU, as they drafted the resolution. Once the body agreed with most of the proposals, including a no-fly-zone, America and its allies went ahead and tabled the resolution. the AU has been a by-stander. It’s pressure from the US, Western countries and Arab nations that forced the leader of Tunisia, Ben Ali, and later Hosni Mubarak of Egypt to step down following popular protests against their leadership. The AU had no say in those crises and is highly unlikely to have a say in the Libyan issue. With the exception of South Africa, many African countries, including Uganda, regard Gaddafi very highly. Gaddafi is said to fund a sizeable portion of AU’s annual budget and pays subscription fees for a number of member countries. Even if such countries were to be listened to on the Libya question, they would be heavily compromised in their opinion. That partly explains why, apart from vocal and wealthy Botswana, no African country has publicly criticised Gaddafi’s military excesses during the crisis. Libyan companies have invested heavily in a number of African countries and, for Uganda’s case, the North African country has a stake in seven companies with a value of more than $375 million, according to figures from Uganda’s embassy in Libya. Gaddafi’s larger-than-life image in Africa was detectable in the tone of Uganda’s Foreign Affairs minister, Sam Kutesa, during an interview with Daily Monitor last week. Emphasizing that Gaddafi needed to yield to the idea of peace talks, Kutesa was quick to add that the Libyan leader, despite the people’s uprising, had served the Libyans well. “(Being) a revolutionary, I think, you are trying to serve the larger interests of society and that includes people’s freedoms and wellbeing,” Kutesa said. While the AU can point to some cases as evidence that it is capable of resolving political conflicts on the continent – such as the impasse in Kenya in 2008 and the one in Zimbabwe in 2009 – it has largely failed to stamp its authority and enforce political discipline among its member states. The list of countries where AU-led mediation has failed is long, but the best case study currently is the political impasse in Ivory Coast, where the incumbent, Laurent Gbagbo and his rival Alassane Ouattara have each maintained that they won last year’s presidential elections. An AU mission led by Kenya’s Prime Minister, Raila Odinga, has so far failed to resolve the impasse and, over the past week, several civilians have died as a result of clashes between supporters of Gbagbo and Ouattara. Some analysts believe that part of the reason why the continental body goes slow on leaders like Gaddafi is because the leadership in many of its member states is not much different. Even where there are periodic elections, they are not free and fair, while in many African countries, there is limited or no freedom of expression and of the press. The fear for some leaders is that if they support tough action against countries like Libya, tomorrow could be their turn. It is also for this reason that many African leaders argue that African states should solve the problems on the continent, not foreigners who might impose tough restrictions. In fact, both Museveni and Zuma of South Africa were unhappy with the UN declaring Outtara elected president of Ivory Coast, proposing an African “solution” that involves investigating who actually won those elections. Despite the hurdles, government officials here remain hopeful that the AU mission will play a significant role in the achievement of peace in Libya. James Mugume, the Permanent Secretary at the ministry of Foreign Affairs, told The Observer on Saturday that other global efforts will instead galvanize the work of the AU. “Everyone recognizes that war will not end the conflict in Libya. We believe that the peaceful efforts by all players [and the AU] will pay off,” Mugume said, adding that the tone of the UN resolution hints on a need for a peaceful end to the crisis. 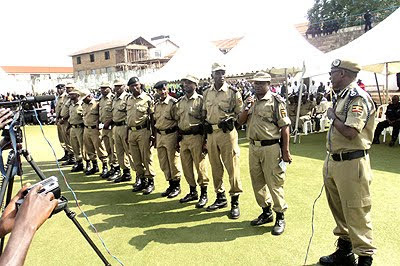 SPECIAL Police constables (SPCs) whose contracts expired mid this month will be turned into a reserve Police force, the Inspector General of Police Maj. Kale Kayihura, has said. Addressing over 1,500 constables during a party at Lugogo hockey grounds on saturday, Kayihura hailed them for their distinguished service in ensuring peace during the elections. He said the Police Act provides for a reserve force. Kayihura said though the contracts of the constables expired, they would remain non-uniformed Police officers. He assured the constables who have not been paid that they would receive their salaries today. “On Monday, I will send a team from the Police headquarters to pay you. Any person who did police work anywhere in the country will be paid,” Kayihura said. About 18,000 constables were recruited countrywide on a one-month contract to help the Police during the elections due to shortage of manpower in the Police. They were to be paid sh11,000 per day translating into sh330,000 at the end of the month. At the function, Kayihura also put to task 13 divisional Police commanders in Kampala to explain whether they had explained to the constables at the time of recruitment that their contracts were meant to be for one month. He later apologised to the constables after it emerged that there were anomalies in three out of the 13 divisions due to lack of effective communication. The Police chief promised to visit the divisional Police stations of Kira Road, Kiira division and Mukono this week to resolve the issues. “I want to thank you for the good work you did. We achieved the mission that we were given by president Yoweri Museveni and the people of Uganda,” he said. “As the overall commander, I was worried because of threats from terrorists, plans by politicians to foment chaos, ensuring that there is no election malpractice and the need to enforce electoral laws,” Kayihura said. He said if there are vacancies in the force, priority will be given to the SPCs during the recruitment as long as they meet the requirements. He said much as the Police would desire to retain the services of the SPCs the force was constrained by the size of its resource envelope. WHAT DO WE LEARN FROM LIBYA? At least four explosions and heavy anti-aircraft gunfire reverberated through Tripoli tonight in a sign that coalition forces have turned their sights on the Libyan capital. As night fell, Libyan state TV claimed in a news flash that both 'civilian and military areas' in Tripoli had been hit by the 'crusader, colonialist aggressors'. Witnesses reported explosions in Sirte as a convoy of 20 military vehicles including truck-mounted anti-aircraft guns was seen leaving the city and moving westwards towards the capital. It was also revealed tonight that NATO have agreed to assume full command of military operations in Libya, ending nearly a week of heated negotiations over the chain of command. The decision, which could take up to 72 hours to implement, puts the 28-member military alliance in charge of operations to target Muammar Gaddafi's military infrastructure and protect civilians, as well as implementing a no-fly zone and an arms embargo. * Beaten by Gaddafi’s nephew and intimidated by his thugs... so why was I treated like a criminal by British justice? Earlier this evening in Sirte, where Gaddafi was born, dozens of civilian cars carrying families and loaded with people's belongings were also seen driving westwards along the coastal road from the city towards the Libyan capital. 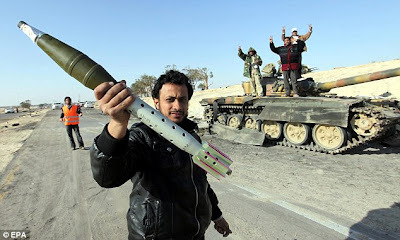 But Gaddafi's forces tonight hit back by firing volleys of mortar rockets into the city of Misrata, killing eight people and wounding 24, as they attempt to counter attack from the west, it has emerged. 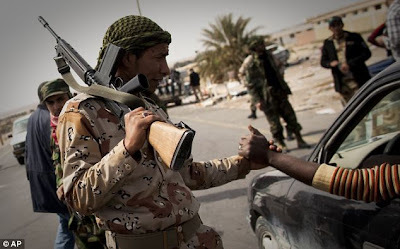 Libyan rebels have already seized power of Brega, Uqayla, Bin Jawad and the important oil town of Ras Lanuf, after moving westwards, emboldened by their recapture of the strategic Ajdabiya yesterday. The capture of Ras Lanuf was the high-water mark of their military campaign earlier this month before Gaddafi pushed them back and it is thought the front line is now west of the oil-exporting settlement. On the eastern approach of Ras Lanouf, airstrikes apparently hit three empty tank transporters and left two buildings that appeared to be sleeping quarters pockmarked with shrapnel. 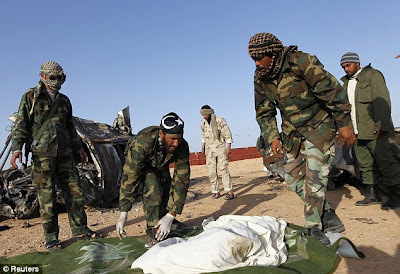 Some rebels suggested that Gaddafi is withdrawing what forces he has left from the east of the country so that he can keep control of the west as air strikes by Britain, France and the UK continue after the UN approved a no-fly zone to protect civilians. 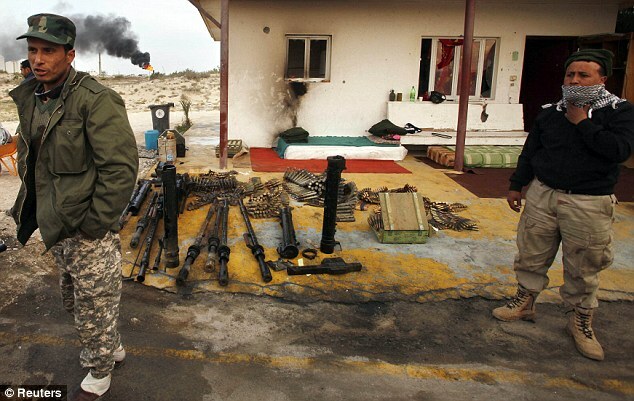 However, there were reports of heavy shelling from government forces on the rebel-held outpost Misratah. Rebel fighter Walid al-Arabi said 'There is no Gaddafi army in Ras Lanuf,' quoting troops who had returned from the town. Despite the rebels’ progress over the weekend, U.S. Defence Secretary Robert Gates yesterday suggested it might not continue at the same pace – warning Britain that it was set to be embroiled in a costly war which would last many months. Mr Gates admitted that ‘nobody knew’ if the military mission in Libya would be completed before the end of the year, and confirmed the White House will ‘diminish’ the military resources committed to the conflict within days – raising concerns that the UK’s stretched Armed Forces will have to make up the shortfall. His comments will fuel mounting fears that David Cameron has involved Britain in a lengthy and expensive military operation without clear goals or a deadline. RAF Tornado jets carried out a second wave of attacks using precision-guided Brimstone missiles to destroy tanks on the edge of Ajdabiya which allowed the rebels to seize the city. Advancing unchallenged, the rebels last night controlled virtually all the sea ports essential to Libya’s oil trade. Defence Secretary Liam Fox said that taking control of Ras Lanuf would put the country's oil exporting capacity in rebel hands. 'What you are seeing on the ground now is the rebels moving west out of Ajdabiya now to Brega, moving back round the coast. That, of course produces a very different political dynamic,' Dr Fox told BBC1's The Andrew Marr Show. 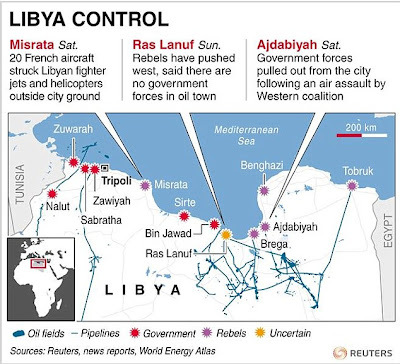 'As they move round the coast, of course, the rebels will increasingly control the exit points of Libya's oil and if they continue to move round that coast from Brega round to Ras Lanuf on the coast, it means they will pretty much be in control of all Libya's oil exports. But he also ruled out supplying arms to the rebels, who cannot match the superior firepower of Col Gaddafi's forces, as it would fall foul of the UN arms embargo on Libya. 'We are not arming the rebels, we are not planning to arm the rebels,' he said. In the west of Libya, where rebel forces are pinned down near the town of Misrata, French warplanes last night destroyed five Libyan aircraft and two helicopters on the ground at an air base. Pro-Gaddafi forces had earlier pounded the city with tank, mortar and artillery fire that halted only as coalition aircraft appeared overhead, rebels said. 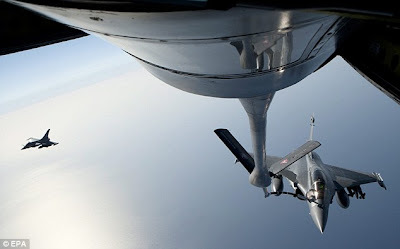 Ministers will be hoping that the signs mean the Western air strikes, which have included missions by RAF Tornadoes, are shifting the balance of power in Libya in favour of the rebels. 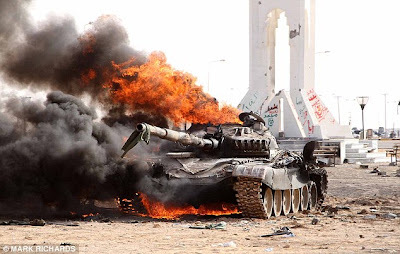 Brimstone missiles from Tornado GR4s destroyed six tanks at Ajdabiya – four on Thursday and two on Friday – and three more in a separate attack on the city of Misrata far to the west. 'This is the objective of the coalition now, it is not to protect civilians because now they are directly fighting against the armed forces,' Khaled Kaim, the deputy foreign minister, said in the capital, Tripoli. Gaddafi remained elusive at the weekend, with a government spokesman suggesting he is moving around Libya to keep his location secret. Muss Ibrahim said: 'He is leading the battle. He is leading the nation forward from anywhere in the country. One resident in Misrata said 115 people had been killed in the city in a week and that snipers were still shooting people from rooftops. In Ajdabiyah, rebel fighters danced on tanks, waved flags and fired in the air near buildings riddled with bullet holes. Half a dozen wrecked tanks lay near the eastern entrance to the town and the ground was strewn with empty shell casings. Rebels said fighting had lasted through Friday night into Saturday. 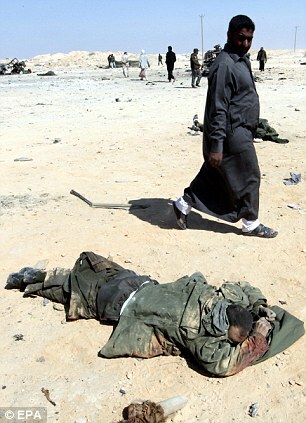 By the town's western gate there were bodies of more than a dozen of Gaddafi's fighters. An abandoned truckload of ammunition suggested his forces had beaten a hasty retreat. 'Thank you Britain, thank you France, thank you America," said one rebel, praising the Western air strikes against Gaddafi's forces. Capturing Ajdabiyah, a gateway from western Libya to the rebel stronghold of Benghazi and the oil town of Tobruk, was a big morale boost for the rebels. In Misrata, the only big insurgent stronghold left in Libya's west, cut off from the main rebel force to the east, shelling by Gaddafi's forces fell silent on Saturday when Western coalition planes appeared in the sky, rebels said. Libya's third city is only about 200 km from the capital and Gaddafi can ill afford to leave it in the hands of anti-government protesters. 'He pulled his forces out of Ajdabiyah and Brega so that he puts all his weight in attacking Misrata and winning so he can control the whole west versus losing the whole east,' a rebel, called Saadoun, said by telephone. 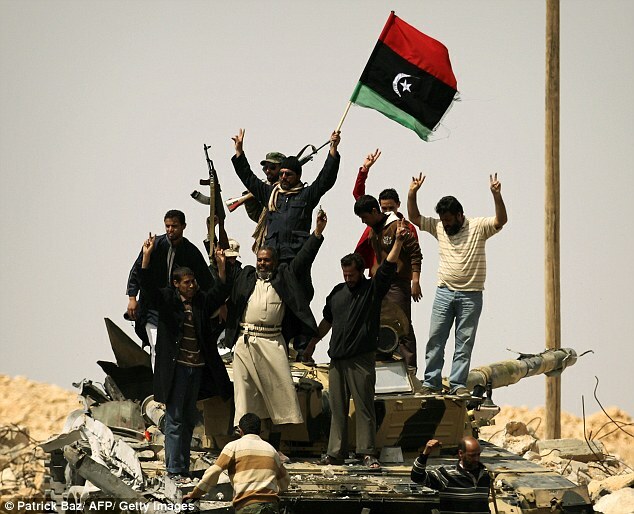 The UN Security Council authorized the operation to protect Libyan civilians after Gaddafi launched attacks against anti-government protesters who demanded that he step down after 42 years in power. The airstrikes have crippled Gaddafi's forces, allowing rebels to advance less than two weeks after they had seemed at the brink of defeat. Dr Fox ruled out Britain supplying weapons, including machineguns and anti-tank rockets, to rebels to hasten Gaddafi’s defeat. Nato, which is in command of a no-fly zone above Libya, agreed last night to take control of all military operations, possibly as early as tomorrow. This would coincide with Mr Cameron hosting the London Conference on Libya. Foreign ministers from more than 35 nations, plus UN Secretary General Ban Ki Moon and African Union chairman Jean Ping, will discuss the crisis. The conference will reiterate calls for Gaddafi to introduce an immediate ceasefire and end violence against Libyan civilians, and aims to ‘support a new political future’ for Libya without Gaddafi. However, Italy risked sparking outrage by suggesting Gaddafi should be given a safe haven. Foreign Minister Franco Frattini wants to put forward a joint plan with Germany involving a ceasefire, a humanitarian corridor and exile for the tyrant. In his weekly address, Barack Obama said the coalition had averted a ‘humanitarian catastrophe’. ‘The lives of countless civilians – innocent men, women and children - have been saved,’ he said. In the end, we simply did not have the petrol to keep up. Our fuel gave out somewhere near Agheila, with the rebel spearhead still several score miles further west. By sundown the leading units were reported to have advanced beyond Bin Jawad and within striking distance of Muammar Gaddafi’s home town of Sirte. Even by the standards of this seesaw conflict, the movement of the battlefront this weekend is a remarkable reversal of fortune. Last week Gaddafi’s armoured forces were in the suburbs of Benghazi. Now the remnants appear to have fled some 250 miles. The rebels are on their heels like a whippet snapping at a badly – possibly fatally – wounded bear. What a difference Nato airpower has made. Friday afternoon had seen me standing a few miles east of Ajdabiya, with Gaddafi artillery fire falling a little too close for absolute peace of mind. 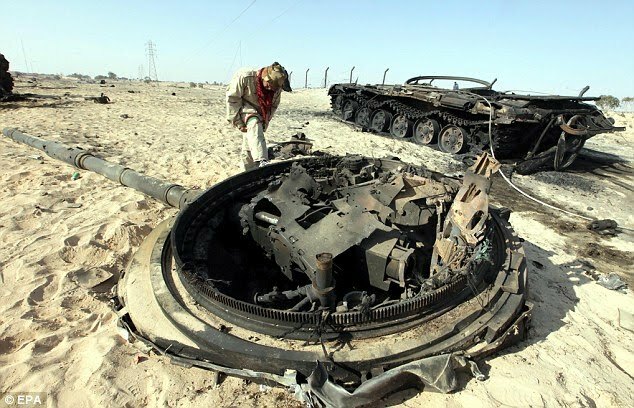 But over the weekend, after days of attack by coalition air forces, Gaddafi positions in and around the town cracked and broke. Two weeks ago, we had left Ajdabiya in a hurry as the town was enveloped by Gaddafi’s advance eastwards. A razor, a pair of jeans, a shirt, socks and towel were among my possessions left behind. So this weekend, with a front-door key still in my pocket and an anxiety to know the fate of the faces and places I had come to know in Ajdabiya, we returned. The road was busy with trucks carrying food, water and medical supplies, streaming towards the town. We sped past the shell-battered water tower which on Friday we had been warned not to go beyond because regime artillery spotters were using it as an aiming point. A roadside café, where we had paused to buy drinks on our way out ahead of the Gaddafi advance, was wrecked. Warehouse buildings behind it bore the impact scars from various calibre munitions. A mosque had several gaping holes in its front wall. Our first stop was the hospital. At the gate, my hand was grasped by two men who repeated: ‘England, England, Cameron, Cameron, we love you.’ Most of the patients and staff had been evacuated during the fighting. Corridors which had echoed with the clamour of staff and families when I was last there, were silent. The morgue was full, of course. Musbah, a trainee doctor from Ajdabiya, told me that more than 80 civilians had been killed while the town was under siege. More than 200 had been wounded, he said. ‘Sometimes the electricity would go off in the middle of an operation because the generator had run out of fuel and the patient would die,’ he said. Three Ukrainian nurses, trapped at the hospital during the battle for the town, begged to use our phone to tell their families they were alive. An Egyptian gynaecologist asked the same favour. In the past week of siege, battle and deprivation, Dr Khaled Gamal had delivered ten babies, two by caesarean section. We sat on the hospital lawn as he made his call to Cairo. ‘Yes, I am alive,’ he told his wife, as she wept down the line. We drove on towards the oil town of Brega. A munitions convoy had been caught in the open; lorries were shattered and burned out, thousands of unfired machinegun rounds were scattered in the desert. ‘Zenger! Zenger!’ was the constant, jeering cry of the rebel fighters who moved among the wreckage of a tyrant’s power. The word means alleyway or passage. It was used by Gaddafi in a televised rant about how carefully – alleyway by alleyway – he was going to scour Benghazi of its rebels. Now it was thrown back in his face. Yesterday we reached the battle-scarred outskirts of Brega. Last time I had been here – March 10 – I was bombed by a Gaddafi jet. On we drove from Brega into the desert marshlands around Agheila. Up ahead Ras Lanuf had been retaken, we were told – and Bin Jawad, where more than two weeks ago the rebels suffered their first defeat and from which they were pushed all the way back to Benghazi. But our fuel was gone. We had not expected to get so far in one day. Who had? And my flat in Ajdabiya? An inner front door, previously left open, had been locked by the last person to leave. The landlord had fled abroad, I was told. My socks will have to be liberated some other day. Meanwhile, the rebel advance continues westwards apace. YOU WANT TO KNOW WHO MUSEVENI IS?